Superbeing Admin March 3, 2017, 7:44 a.m.
You can go for a guided tour in a tea plantation, where you get to know more about tea. You’ll find that what parts of the tea plant are used for the tea. When we hear of tea from India, we first think of tea plantations in Darjeeling or Assam, because these are the most well-known tea regions of India. But the mountains of South India also grow excellent tea. 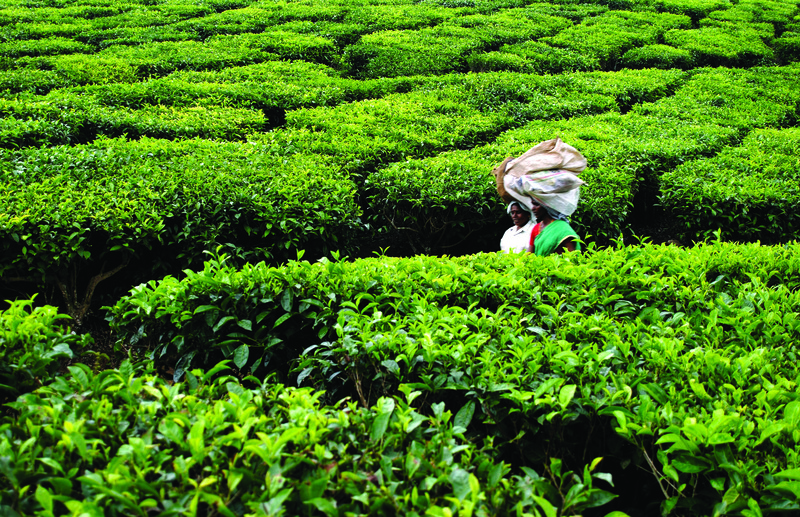 South India is also the fifth-largest tea producer in the world and is even fourth in exports. The road winds serpently from Kottayam, which is almost at sea level, up to the over 1,200 meters high city Kumily. For the approximately 110 kilometers journey you will need around three hours of driving time. But the journey is worthwhile, the view is spectacular: lush green-covered mountains, deep valleys where the fog or clouds hang, and further up, the first wide tea plantations. You leave the sultry of the lowlands slowly behind you. It is still pleasantly warm, but the humidity is much lower. Time to inhale. Kumily is an all-year destination. In the summer temperatures can climb up to 37 ° C, but it is usually warm. In winter (November to February) the temperatures during the day are between 19 and 30 ° C. Kumily is located in the Western Ghats, in the so-called Cardamom Hills in the district of Idukki. The area is popular among local and foreign tourists not only for its pleasant climate, but also for its attractive mountainous landscape, and its tea and spice plantations. Besides spices and tea, which can be bought directly from the shops here, you can also get delicious chocolate varieties, special coffees or textiles, jute and bamboo products from the region. And if you want, you can also visit one of India's great national parks: the Periyar National Park. After about an hour into the drive, you will already reach the tea cultivation area, which continues further upwards. The tea plantations nestle on the steep slopes, with the settlements of the tea pickers and factory workers in between. The tea plants are relatively low, about a meter high - and the slopes where they grow are partly extremely steep. You can go for a guided tour in a tea plantation, where you get to know more about tea. You’ll find that what parts of the tea plant are used for the tea. Very important: the expensive white tea, which is considered very healthy, consists only of the two youngest shoots with tiny leaves. They must not be damaged, should not have any cracks and must be well rolled. If not, they are sorted out. The harvest comes on a conveyor belt on the first floor of the tea factory where it is pre-dried from below with hot air so that the tea does not spoil. Approximately 30% of the moisture is thus removed from the tea. Then the sheets are carried over large slides down to the ground floor, and then sorted out. The good white tea is separated from the rest. Then only the best leaves for the good green or black tea, the ones that roll, are taken. Large machines roll these tea leaves to open the cell walls, allowing the essential oils to develop. Finally, the tea is fermented and the leaves turn copper-red. This activates the tea and reduces the tannin content. And then the tea is dried again and the tea becomes black. Intermediate quality tea is next sorted out. Stalks and leaves, which really cannot be used for tea, are used as compost for the tea plantations. The next level of the "waste" ends up in the tea bags we buy at the supermarket. The guide tour through the tea factory and plantation is very informative and is recommended to any traveler visiting India. You will learn a lot and above all, you’ll start appreciating the cup of tea you brew at home quite differently. At the end of the tour, you can buy some tea from the the factory shop - and that will be really worth it: 25 g of white tea costs only INR 350 (about €4.80); White tea contains ingredients that do not occur in such concentrations in other types of tea. This includes polyphenols as well as antioxidants, which bind free radicals in the body cells and thus strengthen the immune system. For booking your preferred travel packages in India, please send an email to [email protected] or whatsapp @ +91- 8089825363 or fill the booking form by clicking here.